22 Quick, No-Cook Recipes | RealSimple.com. Since it’s another sticky, humid day here in New York, it was fortunate that I came across this article from Real Simple that shows 22 recipes that require no cooking so you can get a tasty meal and not heat up the entire house. Check it out! 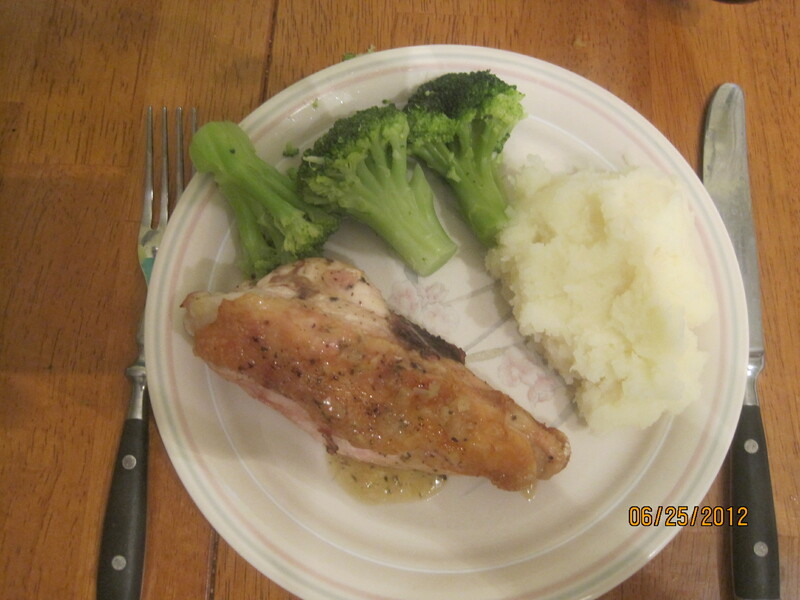 I had planned on chicken all week for dinners, but I had also taken out some pork chops to make for dinner one night. I thought tonight would be a good night to do that and I thought it would be an even better night to have Sean take over in the kitchen. He is planning on taking a cooking class later on this summer so I figured tonight would be a good night for him to do some of the cooking while I just supervised. He chose this recipe of skillet barbecued pork chops as his first test. You don’t have to do the brining of the pork chops if you don’t have time to do it, but it does help to add to the meal by making the pork chops more moist. Dissolve the salt in 2 quarts of cold water in a large bowl or container. Submerge the chops in the brine, cover with plastic wrap and refrigerate for 30 minutes. For the spice rub, combine all the spices in a small bowl. Measure 2 teaspoons of the mixture into a medium bowl and set aside for the sauce. Transfer the remaining spice rub to a large plate. For the sauce, whisk the ingredients in the bowl with the reserved spice mixture until thoroughly combined; set aside. Remove the chops from the brine, rinse and pat dry with paper towels. Use a sharp knife to cut 2 slits, about 2 inches apart, through the outer layer of fat and silver skin of each chop (don’t cut into the meat of the chops). Coat both sides of the chops with the spice rub, pressing gently so the rub adheres. Shake off the excess rub. Heat 1 tablespoon of the oil in a large nonstick skillet over medium heat until just smoking. Place the chops in the skillet in a pinwheel pattern, with the ribs pointing toward the center, and cook until browned and charred in spots, 5 to 8 minutes. Flip the chops and continue to cook until the second side is browned and the center of the chops registers 130 degrees on an instant read thermometer, 4 to 8 minutes. Remove the skillet from the heat and transfer the chops to a plate. Lightly brush the top of each chop with 2 teaspoons of the sauce. Wipe the pan out with paper towels and return it to medium heat. Add the remaining 1 teaspoon of oil and heat until just smoking. Add the chops to the pan, sauce side down, and cook without moving them until the sauce has caramelized and charred in spots, about 1 minute. While cooking, lightly brush the top of each chop with 2 more teaspoons of sauce. Flip the chops and cook until the second side is charred and caramelized and the center of the chops registers 140 to 145 degrees on an instant read thermometer, 1 to 2 minutes. Transfer the chops back to the plate, cover loosely with foil, and let rest until the center of the chops registers 150 degrees on an instant read thermometer, about 5 minutes. Meanwhile, add the remaining sauce to the pan and cook over medium heat, scraping up any browned bits, until thickened and it measures 2/3 cup, about 3 minutes. Brush each chop with 1 tablespoon of the sauce and serve, passing the remaining sauce separately. Sean handled most of the prep and the actual cooking pretty well. The only thing I really did was take the chops out of the pan. 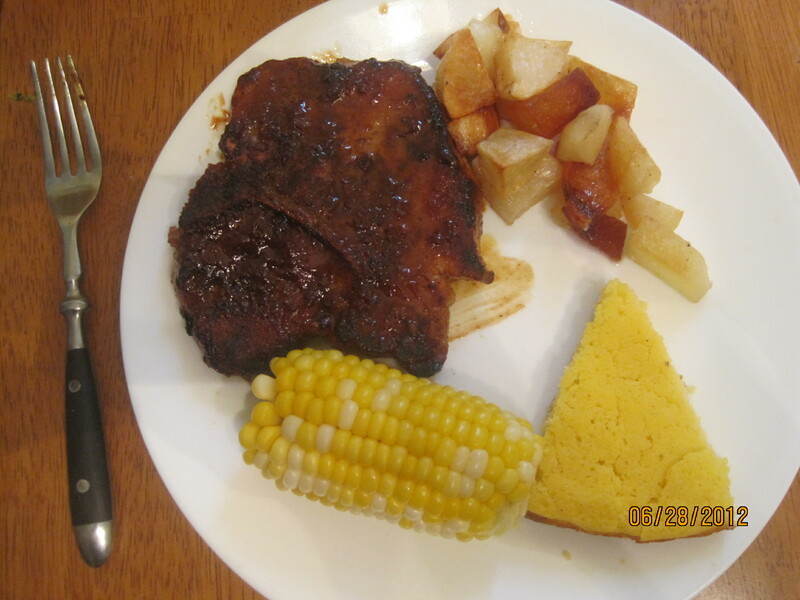 He also made some oven roasted potatoes, corn on the cob and skillet cornbread to go along with the meal. Again, he did most of the work himself, including the chopping of the potatoes, mixing everything for the sauce, the rub and the cornbread. All I handled was the hot cast iron skillet for the cornbread. I have to say I was quite proud of how well he did with everything. Now if I could just get him to clean his room, all would be wonderful! That’s it for tonight. It might be back to chicken tomorrow night, or maybe some burgers, i haven’t quite decided yet. We’ll see what I feel like doing. Enjoy the rest of your evening and enjoy your meal! How to Make Fried Chicken | Cook’s Country – Recipes That Work. Since I have been making chicken meals all week this week, this seemed like a good article to post. I haven’t tried their recipe for fried chicken, but it sure does sound good and doesn’t look any harder than other methods I’ve tried for fried chicken if you want to check it out! Chicken Week, Day 2: Let’s Kabob it Up! 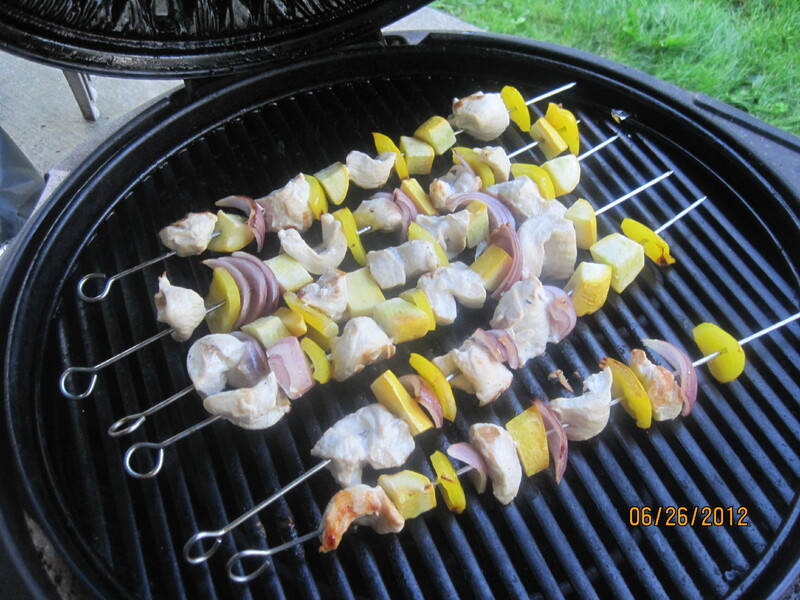 I had boneless chicken breast to use out of the freezer it since it was a nice, comfortable day here today outside I thought it might be a good day to use the grill and make some chicken kabobs. I looked at a few different recipes and settled on this one from Williams-Sonoma. it falls right into the simple with simple ingredients category and makes a nice sauce to go with it. Soak bamboo skewers in water to cover for 30 minutes. Prepare the grill to medium-high. Put the mustard in a small bowl. Add the lemon zest and lemon juice and mix well. Gradually whisk in the 1/3 cup of olive oil, then mix in the chili, if using, marjoram and basil. Season the sauce with salt and pepper. Set aside. Drain the skewers. Thread the chicken, squash and onion onto the skewers, alternating each piece until the skewers are filled. Brush the chicken, squash and onion with olive oil and season with salt and pepper. Arrange the skewers on the grill, cover the grill and cook, turning once until tender and lightly charred, about 5 minutes per side. Transfer to a plate and remove the chicken and vegetables from the skewers. Serve with the lemon-herb sauce. You could certainly vary this in many ways, substituting different colored peppers, using zucchini, or using scallops or shrimp instead of chicken. One way I decided to vary it a little bit was by making a second sauce to serve along with the lemon-herb sauce. I opted to make a cucumber yogurt sauce, knowing I already had all the ingredients on hand it wouldn’t take long to put together. Drain the yogurt in a cheesecloth-lined strainer set over a bowl for 1 hour. In a bowl, combine all the ingredients. Serve as an accompaniment with any variety of foods or as a salad dressing. Michelle really likes the yogurt cucumber sauce, so I do make it as a dipping sauce for other meals. It goes great with lamb, chicken or beef. I served the whole meal with some corn on the cob and white rice to round things out. For dessert, since I had the grill on, I grilled some peaches and pineapple slices, Simply slicing the peaches in half and brushing them with a little olive oil and then brushing the pineapple also with olive oil and grilling both just until you get good grill marks on each, about 4 or 5 minutes. When I took them off the grill, I put just a touch of honey on each piece for some extra flavor. That’s all for tonight’s meal. Tomorrow will be either pork chops or chicken drumsticks in one form or another, I haven’t decided yet. Check back and see what decide to do. Until then, enjoy your evening and enjoy your meal! Let the Week of Chicken Begin!! As I said in yesterday’s post, I have an awful lot of chicken in the freezer and have decided to just cook out of the freezer this week. Tonight I started off with the bone-in chicken breasts. As usual, I wanted an easy recipe, not a lot of ingredients and a reasonable cooking time. As usual, America’s Test Kitchen did not disappoint by supplying this recipe for Pan-Roasted Chicken Breasts with Sage-Vermouth Sauce. it doesn’t take long, gives you moist, juicy chicken and a very flavorful sauce for the chicken. This recipe calls for brining the chicken breasts for 30 minutes before cooking, but if you don’t have the time for that, you can go right to the roasting and it will also turn out well. Dissolve the salt in 2 quarts of cold water in a large container; submerge the chicken in the brine, cover and refrigerate about 30 minutes. Rinse the chicken well and pat dry with paper towels. Season the chicken with pepper. Using a potholder to protect your hands from the hot skillet handle, pour off all but 1 teaspoon of the fat from the skillet; add the shallot, then set the skillet over medium-high heat and cook, stirring frequently, until the shallot is softened, about 1 1/2 minutes. add the chicken broth, vermouth and sage, increase the heat to high and simmer rapidly, scraping the skillet bottom with a wooden spoon to loosen the browned bits, until slightly thickened and reduced to about 3/4 cup, about 5 minutes. Pour the accumulated chicken juices into the skillet, reduce the heat to medium and whisk in the butter 1 piece at a time; season with salt and pepper to taste and discard the sage. Spoon the sauce around the chicken breasts and serve immediately. I served this with some mashed potatoes and broccoli, but you could easily use rice or noodles instead to go with the chicken. The sauce comes out great and has a wonderful flavor thanks to the sage and the vermouth. That’s tonight’s meal, quick and easy. Tomorrow I have a choice between chicken legs and boneless chicken, but I haven’t decided which way I want to go with it yet. It will be a mystery until you check back tomorrow! Until then, enjoy your evening and enjoy your meal! Why Did the Chicken Cross the Road? Apparently to Get to my Freezer. I decided I wanted to cook meals out of our freezer all week since the freezer is packed full. We couldn’t fit a Ritz cracker in there if we wanted to. So I looked int0 there this morning and started pulling things out and noticed we have an awful lot of chicken in there of just about every variety right now. I have a whole chicken, boneless chicken breasts, chicken thighs, drumsticks and whole chicken breasts. Now I just have to figure out how I want to cook it all this week. I think I would like to try to grill as much of it as possible, but I haven’t quite figures out how I am planning to cook it all just yet. I also have some pork chops I plan to make this week as well, but for today I thought I would post a simple recipe I am doing for some bratwurst on the grill. i picked some up at Adams Farms in Newburgh, where they make their own bratwurst and they looked pretty good so I thought I would give them a try. Place the bratwurst in a Dutch oven with the onions and butter. Cover the bratwurst with the beer. Bring to a boil over medium heat and reduce to a simmer until the bratwurst is cooked through, about 20 minutes. Meanwhile, heat a grill to medium high heat. Remove the bratwurst from the Dutch oven and place on the grill. Grill until golden brown, about 5 to 10 minutes. Serve the bratwurst on hot dog buns or sub rolls with the onions, sauerkraut, grilled onions, grilled peppers and/or mustard (onions and mustard are my particular favorites). I love a grilled bratwurst where you get the crunch of the bratwurst and the spice mixed with the onions and the mustard, yum yum. Serve them with some potato salad or grilled potatoes and either corn on the cob or some grilled vegetables like zucchini, and you’re all set. And don’t forget to have some beer ready to go along with the brats. Now I have to find some chicken recipes for this week. If anyone has some good suggestions, please pass them along! I’ll scout around and see what I can come up with for stuff on the grill this week and hopefully post them today or tomorrow. until then, enjoy your day and enjoy your meal! Sooner or later it’s going to cool off a bit around here. It’s been really, really hot here and of course I wanted to cook out today, but the thunderstorms we had here put an end to those hopes for today. I will still provide the recipe I had planned to cook today, which was flank steak with salsa verde (it was still too hot to cook tonight and since it was Sean’s last day of school before summer break we let him decide on a meal and he picked Chinese food, so that’s what we had). I still plan to make it, and when I do I will add a picture to this post. It seems like a pretty simple recipe that shouldn’t take long to make at all and it sounds delicious. For the salsa verde, pulse the parsley, scallions, capers, lemon zest and juice, anchovies, garlic, mustard and olive oil in a food processor until slightly chunky. Pour into a bowl and season with salt. Preheat the grill to high or place a grill pan over high heat. Pierce the steak all over with a fork and season with salt and pepper. Oil the grill or the grill pan; grill the steak, 4 to 5 minutes per side for medium-rare, turning once. Transfer to a cutting board and let the steak rest for 5 minutes. Thinly slice the steak against the grain and serve with the salsa verde. It can’t much easier than that. I plan to serve this with a tomato salad. I am going to slice some tomatoes, lightly season them with salt and pepper and pour a little extra-virgin olive oil on them. I may add some sliced avocado and some black olives to it as well. if you like, you could also add some sliced fresh mozzarella or feta cheese to round it out. This steak would also go well with some grilled asparagus or even some foil potato packets if you are grilling. Just a quick recipe today. I am trying to plan the menu out for next week. Now that school is over and Sean will be home I want to try to get back to our menu planning. I am planning to use stuff out of our freezer all week next week, since the freezer is packed with food, so we’ll see what I can come up with. Until next time, enjoy your evening and enjoy your meal!